Description About The Author:- Prof. K.S. Chalam, Member, Union Public Service Commission is a well-known Political Economist. He served as Vice-Chancellor, Dravidian University, Kuppam, Andhra Pradesh, Member Planning Board, Govt. of Madhya Pradesh (2002-2004), Founder Director Academic Staff College, Andhra University, (1987-2005), Director, Swamy Ramanand Tirtha Rural Institute Bhoodan Pochampally (1997098), A.P. and Professor of Economics at Andhra University, Visakhapatnam etc before being appointed as the Member the UPSC in 2005. He was the recipient of the UGC young social scientist Award in 1984 and several other Awards. He has so far published 22 books in English and 6 in Telugu- besides authoring about 90 Research Papers. He has traveled widely in more than 15 countries and participated and Chaired Sessions at International Conferences and Seminars. Prof. Chalam is a sensitive Scholar and thinker with deep concern for the poor and underprivileged.Contents:- Prologue â¢ Higher Education Policy and Reform â¢ Knowledge Outcomes and Evaluation â¢ Equity and Quality Syndrome â¢ Competencies for Good Teaching â¢ Crisis in Professional Education â¢ Inclusive Education and Social Empowerment â¢ Productivity of Higher Education and Economic Reform â¢ Financial Strategy for Educational Reforms â¢ Addressing Inequity in human Capital under foreign universities Regime â¢ Emerging Dichotomies during Economic Crisis â¢ Deconstructing Dichotomies through Public Accountability â¢ Annexures â¢ Bibliography â¢ Index.About The Book:- Higher Education Policy In India Is Fraught With Several Dichotomies. The Incongruities In The Policies Of The Colonial And Native Indian Rulers Were Always There. They Came Out On The Surface After Independence. It Seems The Reform Agenda Of The Successive Governments Have Not Been Able To Solve Some Of These Contradictions. In Fact, The Dichotomies In Certain Areas Like Quality, Equity, Good Teaching, Financing, Social Relevance, Empowerment, Etc., Have Remained Unresolved. The State And The Private Players Need To Understand The Existing Problems And Dichotomies In Higher Education. The Deconstruction Of The Dichotomies Appears To Be Possible Through Public Accountability In The Form Of Performance Indicators. 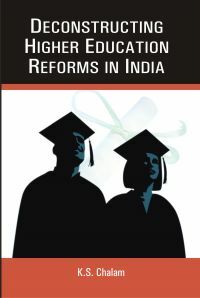 The Book Is Useful To Students And Scholars In Education, Economics, Policy Makers And To Those Who Are Interested In The Future Of Higher Education., About The Author:- Prof. K.S. Chalam, Member, Union Public Service Commission Is A Well-Known Political Economist. He Served As Vice-Chancellor, Dravidian University, Kuppam, Andhra Pradesh, Member Planning Board, Govt. Of Madhya Pradesh (2002-2004), Founder Director Academic Staff College, Andhra University, (1987-2005), Director, Swamy Ramanand Tirtha Rural Institute Bhoodan Pochampally (1997098), A.P. And Professor Of Economics At Andhra University, Visakhapatnam Etc Before Being Appointed As The Member The Upsc In 2005. He Was The Recipient Of The Ugc Young Social Scientist Award In 1984 And Several Other Awards. He Has So Far Published 22 Books In English And 6 In Telugu- Besides Authoring About 90 Research Papers. He Has Traveled Widely In More Than 15 Countries And Participated And Chaired Sessions At International Conferences And Seminars. Prof. Chalam Is A Sensitive Scholar And Thinker With Deep Concern For The Poor And Underprivileged., Content:- Prologue â¢ Higher Education Policy And Reform â¢ Knowledge Outcomes And Evaluation â¢ Equity And Quality Syndrome â¢ Competencies For Good Teaching â¢ Crisis In Professional Education â¢ Inclusive Education And Social Empowerment â¢ Productivity Of Higher Education And Economic Reform â¢ Financial Strategy For Educational Reforms â¢ Addressing Inequity In Human Capital Under Foreign Universities Regime â¢ Emerging Dichotomies During Economic Crisis â¢ Deconstructing Dichotomies Through Public Accountability â¢ Annexures â¢ Bibliography â¢ Index.